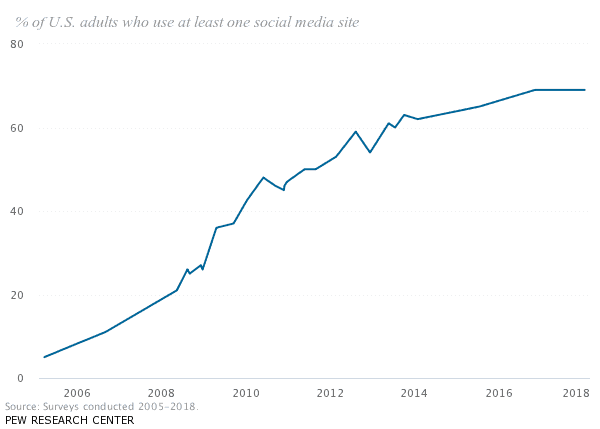 Check out the growth in social media usage from 2006-2018! To remain visible and relevant in today’s modern world, it’s been made pretty clear that social media is a must! 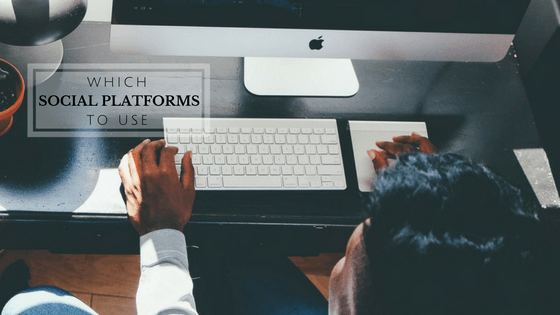 These platforms, especially the most popular ones, are free to get started; and everyone else is doing it… so if you aren’t, just think of the opportunities and audience you could be missing out on and handing right over to your competition because you aren’t being seen. 92% of marketers say that social media has helped increase exposure. Knowing what you are trying to achieve will help you determine your platforms. Your objectives and goals will drive your message, your language, your content, your desired audience, and more. Conduct a simple customer survey, asking them what social sites they use, where they get their news and information online, who their favorite celebrities and influencers are, etc. Turn to the platforms themselves. On Facebook, for instance, you can set your ideal customer, and they will give you an estimate of your audience size. Look at current research studies. 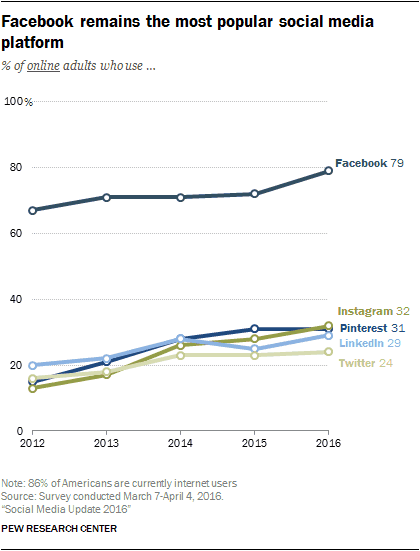 Here is a recent study by Pew Research Center detailing social media use and statistics in 2018. Are you looking to reach a younger audience? Are you looking to reach a younger audience, age 18-24? Consider YouTube, Facebook, and Snapchat. But notice how Snapchat’s popularity drastically declines with the older audiences, and even anyone age 30 and above. 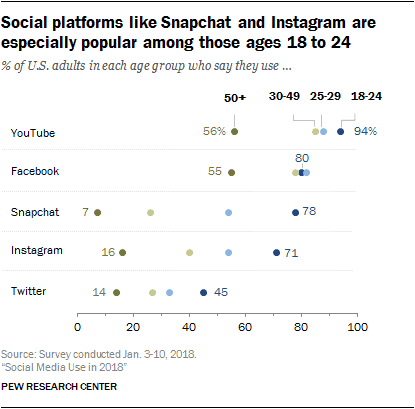 Examine the chart above to learn more about individual platforms and their audience demographics. Certain types of content perform better on certain platforms. For example, if you have a highly visual brand, Instagram is a must. If you have an audience who enjoys listening to a show more than reading and scrolling through a newsfeed, consider podcasts! Once you have a firm idea of your digital marketing objectives, you figure out where your audience already exists, and you determine your content type, finding your key platforms becomes much more simple. Now, you can compare the various platform options to find which works best for you and your business. Facebook. Facebook is an absolute powerhouse… we all know this! It has over 2 billion monthly active users. 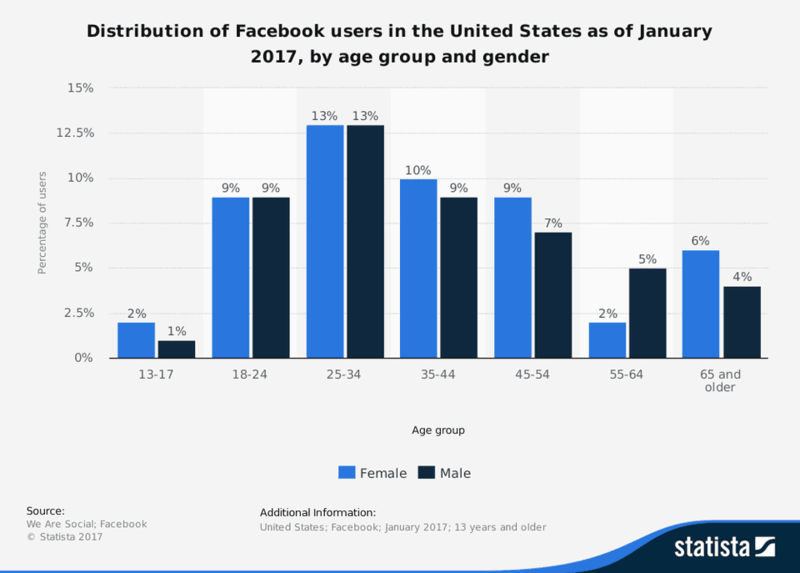 61% of those users are Americans age 25-54, with only 9% of users in the 18-24 group (forbes.com). If your company targets a middle-aged to older market, Facebook could be extremely valuable. 44% of users check their account several times each day! Facebook is great for lead generation and connecting with your audience. It allows you to build relationships and connect with one another, eventually turning leads into loyal followers and customers. One really cool thing about Facebook is their Audience Insights, which shows you data (demographics, interests, behaviors) about your audience so you can better target your ads. Facebook’s ad platform also has a lot of customization that allows you to focus on and target categories as specific as you’d like. With 79% of online adults using Facebook, it’s a force to be reckoned with! Twitter. Like Facebook, Twitter has a huge user base. It has the potential to reach a large amount of people, but there is also a lot of competition and noise. Twitter is great if your business depends on immediacy. It’s the spot for breaking news, important messages, urgent announcements, and other in-the-moment information. Text-based content, like how-to articles, lists, and quotations, tend to perform best on Twitter. Users can easily interact with one another by mentioning their usernames in their posts, which allow people around the world to connect instantly. They have a user base mainly under the age of 50 (digitalmarketinginstitute.com). Snapchat. A goldmine for targeting millennials! 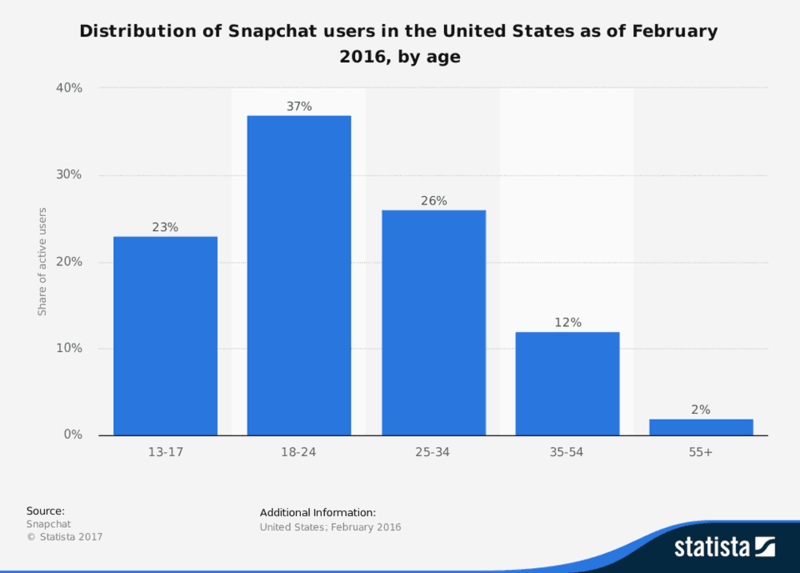 60% of U.S. Snapchat users are under age 24 (forbes.com). Companies on Snapchat like to capture their audience by sharing behind the scenes footage, announcing product launches, doing interviews, showing live tutorials, and so much more. Instagram. Known for being a creative, highly visual platform, Instagram is all about the images! With more than half a billion daily active users, Instagram is excellent for helping companies to build their brand image and connect with their audience. Artistic niches tend to really excel on Instagram. LinkedIn. LinkedIn is usually the platform B2B businesses turn to. It’s excellent for lead generation and having conversations with those leads, and it’s the ideal platform for editorial content. LinkedIn allows businesses to share their knowledge and establish themselves as trusted leaders in their industry or field. LinkedIn’s user demographic differs in that it has more users age 30-49 than those under 30; it also tends to be a more career-oriented, professional audience. Pinterest. Again, it’s all about the visuals here in order to grab attention. There are a lot of food, art, fashion, decor, and travel concepts on the site. Businesses can leverage topics that provide answers for viewers, using beautiful images to catch their interest. Pinterest has a great way of linking to articles/tutorials/how-to’s/etc. in order to provide solutions to problems, and has been shown super effective in driving sales. They have a “buy” button that makes purchasing a breeze. Over 90% of users plan purchases using Pinterest (digitalmarketinginstitute.com). 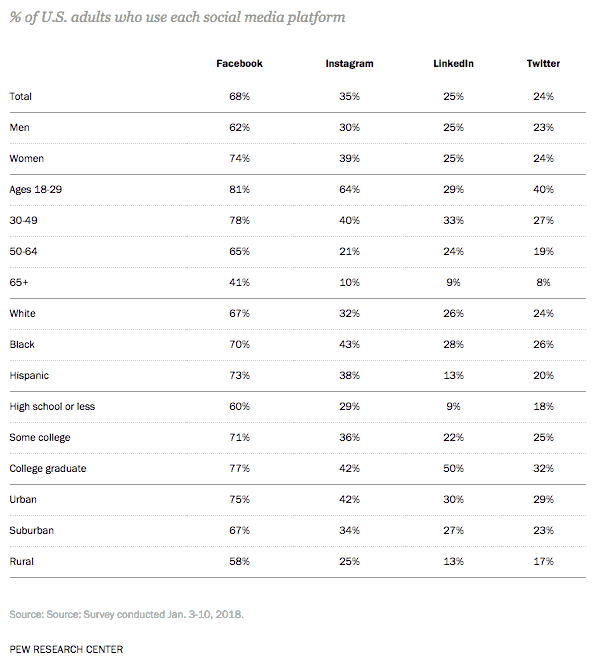 Pinterest is known for its female-dominant audience (42% of online women use Pinterest) and wide age range (34% of users are ages 18 – 29 and 28% are 30 – 49). If you have a female-focused company, you should definitely be considering Pinterest. YouTube. Is your audience all about video? Is your business something easily demonstrated through video? YouTube isn’t something most small businesses initially start with as part of their digital marketing strategy, but it is definitely something worth adding on if possible! It’s a huge hub for video and entertainment. Not only does it satisfy that video-hungry audience, but it adds a whole new element of Search and makes your business more discoverable. 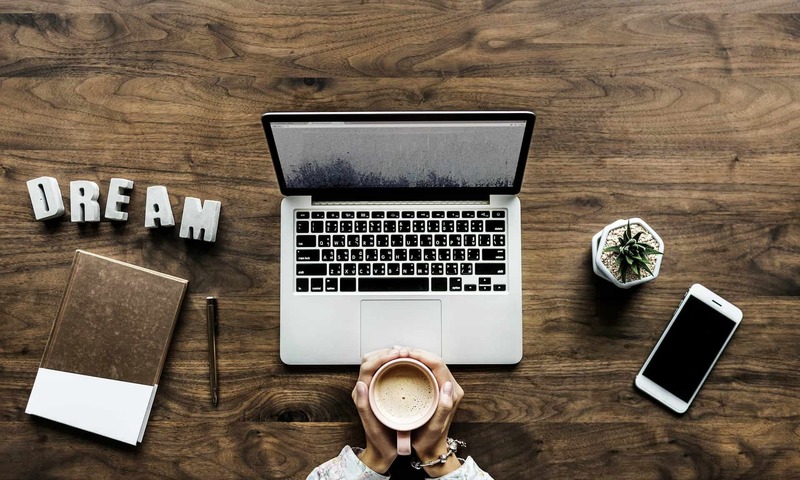 Social media allows the perfect opportunity to provide customer service, connecting with audiences far and wide (or right next door), building brand awareness and brand loyalty. It allows you to find new leads, and connect with them! It increases website traffic (and sales). But your time and resources are likely limited as a small business, so it’s important to really think this through and get it right! Do your due diligence, and don’t waste time on platforms that aren’t conducive to your overall marketing strategy. Instead, devote your energy to platforms that are going to be the most beneficial. The key to choosing the appropriate platforms for your business is getting your goals straight. What is it that you are trying to achieve through your social media marketing? Also, know where your audience exists and the type of content they need. No matter which social media platforms you decide are right for you and your business, remember that it’s all about building and providing a connection with your audience. Stay tuned for the next segment in our “Parts of a Digital Marketing Strategy” series! Up Next: Determining Your KPIs. Helping small business owners meet their digital marketing goals.